Tom Theobald explains how he got an EPA document revealing that the agency is allowing the widespread use of a bee-toxic pesticide in spite of warnings from EPA scientists. Now he fears his industry — and a third of American agriculture — may not last long. 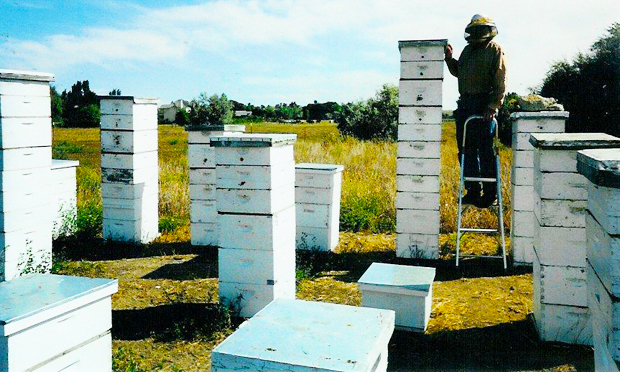 of a bee-toxic pesticide, in spite of warnings from EPA scientists. So how did Theobald (pictured above) end up with such a contentious document? Bayer, the corporation behind clothianidin (the pesticide in question), published a life cycle study about it in 2006 at the EPA’s request. The study was flawed–test and control fields were, for example, planted as close as 968 feet apart. But the EPA continued to allow the use of clothianidin, which has been on the market since 2003 for use on corn, canola, soy, sugar beets, sunflowers, and wheat (and which has been banned by Germany, France, Italy, and Slovenia for its toxic effects on bees, birds, and other species). scientifically sound, and I asked if it had been documented, if there was a hard copy,” he says, “The [employee] said yes, and I asked if I could get a copy.” And just like that, he had the proof he needed that the EPA had overlooked something that could be killing America’s bees. Theobald has been concerned about clothianidin since it was first released in 2003. The pesticide is a neonicotinoid–a type of insecticide that disrupts the central nervous system of insects. Imidacloprid, the first neonicotinoid to be released in the U.S., came on the market in 1994, and began raising red flags soon after. France banned imidacloprid in 2003 due to concerns of bee die-off triggered by the substance. That’s because the giant agriculture industry couldn’t produce nearly as much with native bee pollinators alone; instead, the industry relies on beekeepers, who rent out their bees to pollinate everything from strawberries and blueberries to squash and cucumbers.